Baking soda is a common item found in many households and has a variety of uses besides its obvious purpose — baking food. People use it to keep smells in the fridge at bay, to minimize pet odor, and even to clean carpets and clothes. 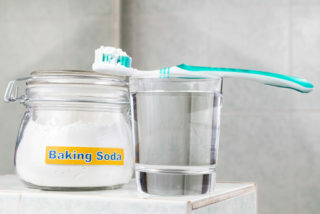 For many years, baking soda has also been used to whiten teeth. But does it actually work, is it safe, and should you do it? Our dental office in Austin has the answers. While baking soda can help remove minor discoloration and staining, it’s not incredibly effective at erasing deeper stains. Some people who try to get a whiter smile through the use of baking soda are unhappy with the results. If this happens, there are several alternatives available. In-office professional whitening treatments can whiten your smile by several shades, and at-home kits provide a convenient option. If neither one of those options work, veneers or other forms of cosmetic dentistry may be the answer. Talk with your dentist in Austin to determine which solution is best for you. If you’re looking to get a whiter smile and want to explore your options, give our Austin dental office a call to schedule an appointment today. We’ll review the type of staining you have, what shade of white you’d like to achieve, the best way to get you a bright, white smile that you’ll be proud to show off. At our dental office in Austin, we want all of our patients to be confident with their appearance at every age. And we’re dedicated to doing everything we can to help with that. While we can’t help with hair or exercise, we help with one really important feature — your smile. When gums recede, more of the tooth becomes visible, making it look longer. Unfortunately, longer teeth are also associated with a higher age, hence the phrase ‘long in the tooth.’ Gum recession is usually caused by rough brushing, grinding, gum disease, or even genetics. But don’t worry, there are several ways to fix it. If caught early, a simple change in your brushing technique may be enough. If it’s more progressed, a deeper cleaning known as scaling and root planing, or gum grafting may be appropriate. Your dentist in Austin will discuss the best option for you. If you’re concerned about your smile’s appearance, our Austin dental office can help. Give us a call today to schedule an appointment. We’ll discuss your smile goals and determine the best way to reach them.